Sekhar Kammula is widely known for his path breaking films. He captures the essence of the subject beautifully with a rare combination of aesthetical value and commercial success. The maverick director has various prestigious awards ranging from National Film Awards to Nandi Awards to his name. His 2007 movie Happy Days won him a lot of appreciation and had the cash registers ringing. 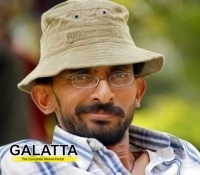 He forayed into filmmaking with Dollar Dreams, which won him the National Film Award for Best Debutant Director. Vidya Balan was seen playing the central character in Kahaani. The cast of Tamil and Telugu version are yet to be finalized. The story of Kahaani revolves around a pregnant woman who is in search of her missing husband in the city of Kolkata.Word-of-mouth publicity and good critical response paved the way for Kahaani's commercial success at the box office. >>Thala 59 Shooting Spot Pictures Go Viral! >>This Top Star in Thala 59 ? >>Big Plans ahead of NTR biopic January Release ! >>NTR Biopic : Second Single Rajashri Is Here ! >>Huge update On NTR Biopic !